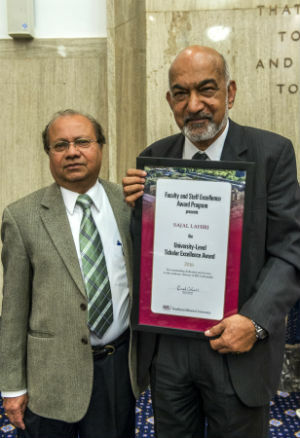 Sajal Lahiri (pictured, right) stands with department chair Subhash Sharma during awards ceremony. Professor Sajal Lahiri, The Vandeveer Chair Professor in the Department of Economics, is the recipient of the 2016 University-Level Scholar Excellence Award. The University-Level Scholar Excellence Award is an exceptional one, given only to those who have made outstanding contributions to their discipline and have thus become widely recognized for their achievements by other scholars in the field. Professor Lahiri joined the Department in August 2002 and holds the only fully endowed chair on SIU Carbondale campus. He teaches International Trade and Development Economics. Professor Lahiri received his Ph.D. from The Indian Statistical Institute, Calcutta, India, where his Ph.D. dissertation was guided by Professor Sanjit Bose, who was a Ph.D. graduate from MIT. Professor Lahiri is one of the most versatile economist whose research interests are very broad. Professor Lahiri started his research career by making a significant contribution in a series of papers on input-output models. Input-output models were originally introduced by Professor Wassily Leontief in 1941 in his book, The structure of American Economy 1919-1920. In 1973, Professor Leontief received a Nobel Prize in Economics for introducing these models. Among other analyses, these models are also used to estimate the economic impact of an industry, an institution, or an organization, etc. I (along with Kyle Harfst and a graduate student) used these models to estimate the “Economic Impact of Southern Illinois University Carbondale in the region and the State of Illinois”. Professor Lahiri’s contribution to the input-output models was so significant that when Professor Leontief passed away, Professor Lahiri was asked by the editor of one of the top journals, Economic Journal (ranked as 5 on a scale of 1 to 5, 5 being the best), published by the Royal Economic Society, to write an obituary on Professor Wassily Leontief, which appeared with the title, “Professor Wassily W. Leontief, 1905-1999,” in Economic Journal, 2000, Vol. 110, 695-707. Professor Lahiri is well known for his work in International Trade (in free trade issues, international obligatory rate of tariff and trade policies) and Economic Development (foreign aid, child labor, foreign direct investment and environmental issues). Besides such broad topics, he has also written on illegal immigration, taxes and economics of conflict. No matter in what areas of economics Professor Lahiri has worked, he has always been concerned about the welfare of the society. Thus, his research has many policy implications for the welfare of the society. He has published papers in International Trade (Theory and Policy), Development Economics, Environmental Economics and Microeconomics among others. So far, he has written four books, published 115 papers, chaired 46 Ph.D. dissertations and 60-70 Master’s Theses. Besides his 115 papers in prestigious journals, Professor Lahiri has also written 24 chapters in edited books, 10 book reviews and 8 other articles generally related with trade policies. Out of the four books, three have been written after joining SIU Carbondale. These are all advanced books as research reference and not text books. He has published his research in top quality journals. Out of the 115 papers, almost 50 are published in top economics and field journals ranked 5 (on a scale 1 to 5, and 5 being the best). Another 32 are published in journals ranked as 4. Publish or Perish website and Google Scholar website reveal that Professor Lahiri’s work has been cited 2247 times so far. That is really remarkable. His paper, “Helping minor firms reduces welfare”, in the Economic Journal, 1998, has been cited 249 times. Another paper (with S. Jafarey), “Will trade sanctions reduce child labor? The role of credit markets”, in the Journal of Development Economics, 2002, has been cited 152 times. Other paper (co-authored with P Raimondos-Moller), “Lobbying by ethnic groups and aid allocation”, in the Economic Journal, 2000, has been cited 107 times. Yet another paper (co-authored with Y. Ono), “Foreign direct investment, local content requirement, and profit taxation”, in Economic Journal, 1998, has been cited 101 times. Moreover, his paper (co-authored with M. Keen) titled, “The comparison between destinations and origin principles under imperfect competition”, in Journal of International Economics, 1998, has been cited in literature 90 times. Besides these top cited papers, 5 papers have been cited between 50 and 90 times; 6 papers have been cited between 40 and 49 times; 9 papers between 30 and 39 times; 18 papers between 19 and 29; and 14 papers between 10 and 14. Thus, the quality and usefulness of Professor Lahiri’s work is absolutely assured by the number of citations he has received. The research division of the Federal Reserve Bank of St. Louis, IDEAS, created a ranking of 42,652 economists by using the data from Research Papers in Economics, RePEc. According to their website, https://ideas.repec.org/top/top.person.all.html, Professor Lahiri is listed among the top 5% of the economists. He has presented his work regularly at prestigious conferences around the world. So far, he has presented at 61 conferences in the UK, Spain, Japan, Greece, Hong Kong, Ireland, Finland, Germany, India, Sweden, Canada, Turkey, and South Africa among others. Besides these presentations, he has been an invited paper presenter at eleven conferences. Not only that, he has been a keynote speaker at the European Science foundation Conference in Italy in 2001. Prior to joining SIU Carbondale in 2002, he also had extensive professional experience in UK. Being a well-known economist in the UK, The Lord Chancellor of the United Kingdom appointed Professor Lahiri as a member of the Restrictive Practices Court to hear a case on Retail Price Maintenance (RMP) involving medicaments. He was one of the three judges for the case. It was the last case of RPM which was lawful in the United Kingdom. The trial started on the 24th of April 2001 at the Royal Court of Justice, London, and came to an end on the 15th of May 2001. RPM on medicines is now unlawful in the United Kingdom. As soon as the case ended, super markets across the country started giving discounts (up to 50%) on branded medicines. 1977-1978 Post-doctoral Fellow in Economics at the University of Warwick, U.K.
1978-1989 Lecturer in Economics, University of Essex, U. K.
1989-1991 Reader in Economics, University of Essex. 1992-2002 Professor of Economics, University of Essex. 1984-1985 Visiting Associate Professor of Economics, Southern Methodist University, U.S.A.
1986 (July) Visiting Fellow, Development Economics Research Centre, University of Warwick, Coventry. Fall, 1986 Visiting Fellow, Research School of Social Sciences, Australian National University. Summer, 1988 Visiting Scholar, Institute of Social and Economic Research, Osaka University, Japan. 1991 (September) Guest-Research Fellow, Copenhagen Business School, Denmark. Spring, 1993 Visiting Scholar, Institute of Social and Economic Research, Osaka University, Japan. Summer, 1994 Visiting Fellow, Economic Policy Research Unit, Copenhagen Business School. Spring, 1998 Visiting Foreign Scholar, Institute of Social and Economic Research, Osaka University. March, 1998 Consultant, International Fund for Agricultural Development. Dec., 2000 Consultant, International Fund for Agricultural Development. Apr.-Oct., 2001 Member, Restrictive Practices Court, The Royal Court of Justice. Nov 2001-Dec 2002 Consultant, International Fund for Agricultural Development. Jan 2002-Mar 2002 Consultant, Food and Agricultural Organization of the United Nations. Summer, 2004 Visiting Researcher, Research Institute of Economics and Business Administration, Kobe University Japan. Autumn, 2006 Consultant, The World Bank. October, 2008 Visiting Foreign Scholar, Institute of Social and Economic Research, Osaka, University, Japan. November, 2008 Research Visitor, Department of Economics, City University of London. December, 2009 Visiting Researcher, Macquarie University, Sydney, Australia. March, 2010 Visiting Researcher, University of Cyprus, Nicosia, Cyprus. November, 2013 Visiting Professor, Visiting Professor, Centre for Training and Research in Public Finance and Policy at the Centre for Studies in Social Sciences Calcutta, India. May 2014 Visitor, College of Economics and Trade, Hunan University, China. Professor Lahiri’s book (co-authored with Y. Ono) titled, “Trade and Industrial Policy Under International Oligopoly,” published by the Cambridge University Press, made a significant theoretical contribution on Trade and Industrial Policies in a multi-country set up. In this book they define trade in a broad sense which includes trade in commodities and trade in capital, i.e. foreign direct investment. They examine in a theoretical framework various industrial and trade policies under conditions of imperfect competition. They noted that firms with different levels of efficiency in a country play an important role in industry and trade policies in a multi-country trade. Under the assumption of full employment, the first part of the book examines trade in commodities and assuming some unemployment the second part of the book focuses on foreign direct investment. This book made quite a significant contribution to the industrial policies under imperfect competition and has been useful to researchers and policy makers in International Trade and Industrial Economics.